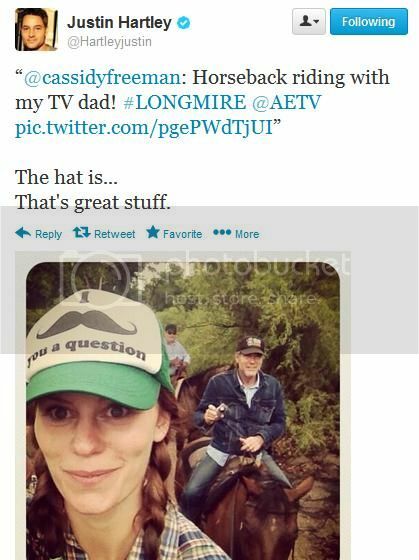 I take an interest in how the SV cast interacts - or doesn't interact - on twitter. Behind the cut, an unscientific and incomplete survey of who's been talking to who recently. AM gives her Con buddies a shout-out - she's started using her twitter more frequently this year. Sam mostly chats - and flirts - with Laura, but gives AM a hello here. I did not know Michael & Alaina (Black Canary, Abaddon on SPN) were pals! But they hung out this past Hallowe'en. 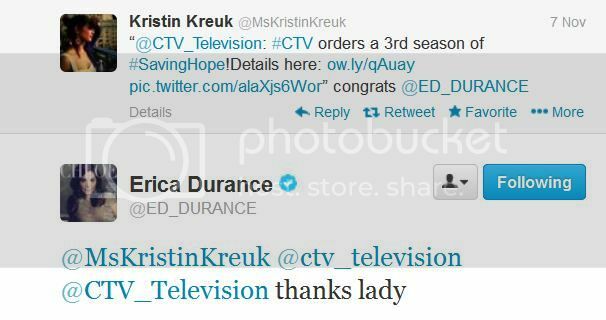 Michael used to be Laura's SV favourite *nostalgic*...now that honour goes to Erica! AM & JH banter quite a bit - he's got a dry wit about him. Cassidy doesn't tweet frequently but pops up for some weather chat with AM. JH can't resist that amazing hat! A love-in for the SV ladies. Aaron doesn't tweet much but pops up to congratulate Laura! And although the Big Guy doesn't have a twitter, he's not forgotten! 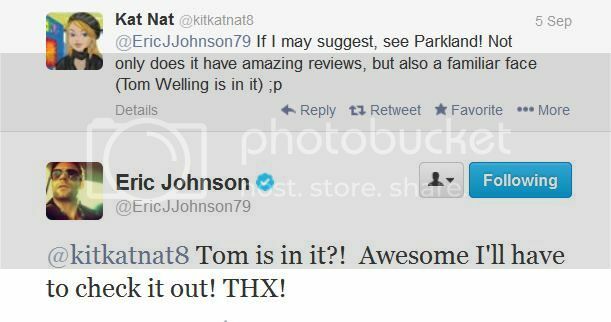 Eric gets excited over Parkland. This was fun to read. Thanks for putting it together. I love that there's a picture of "Dr. Hartley" outside the ladies' room. I imagine under his picture it says, "Mammograms save lives"
Thanks! It's heartening how they all still like to chat. What a fun post! Thanks so much for gathering all these! 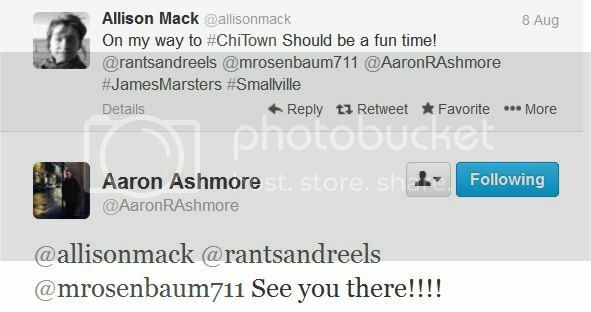 I follow a lot of the Smallville alums on Twitter, but I'm online so seldom these days I miss most of their tweets. It's lovely to see how genuinely supportive they are of one another. And Justin is always ready with the self-deprecating humor, that is too funny what he said about EOMD (which I was sorry to see cancelled). One thing that has been wonderful to watch on Twitter is how excited all of Michael's friends are about BITD coming out. I love the closeness he obviously shares with his friends, and how he defies the Hollywood stereotype of being shallow and superficial. He is such a good man. I can't wait to see BITD! Thanks! It always makes me smile when SV alumni start chatting. 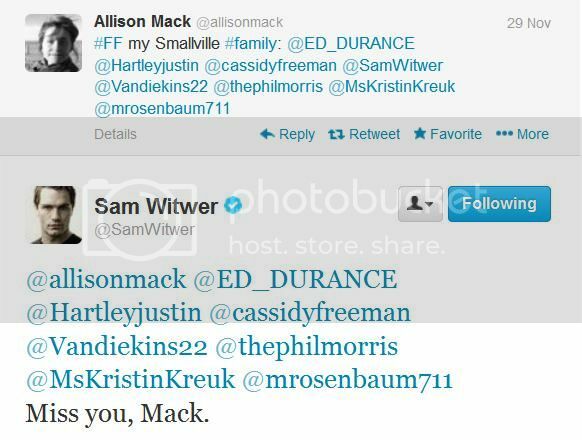 Yes, that was the perfect wry response...Hopefully his success on Revenge has sweetened that pill a little! 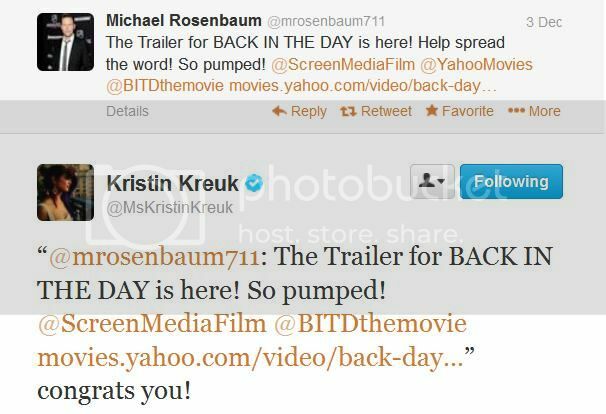 One thing that has been wonderful to watch on Twitter is how excited all of Michael's friends are about BITD coming out. 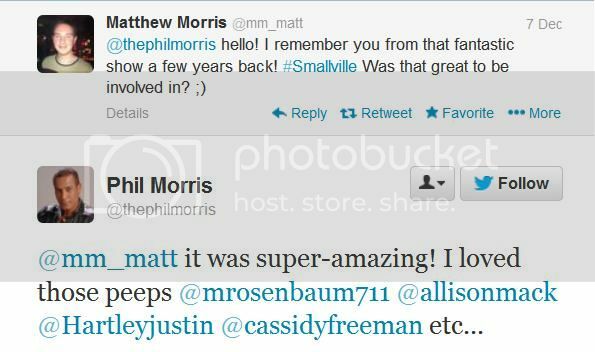 They're all so supportive - fellow actors and hockey players and his hometown principal - it's really sweet. I can't wait to see BITD! I hope it does well for him. He & Morena look stunning together! You're welcome! I like how they're all still friendly. I adore how Eric Johnson still cheerleads for the actor. He was on it for 2 out of the 10 seasons and he still gives them love. Even people who came after the fact like ED. He's the best. He's a sweetheart. I love that he & KK still hang out. If he did manage to get to the Parkland premiere, I bet Tom got a big blond hug! Aww, it's nice that they are still friends! Justin's response did make me laugh - he seems quite amusing. Shame Oliver was such an arse. 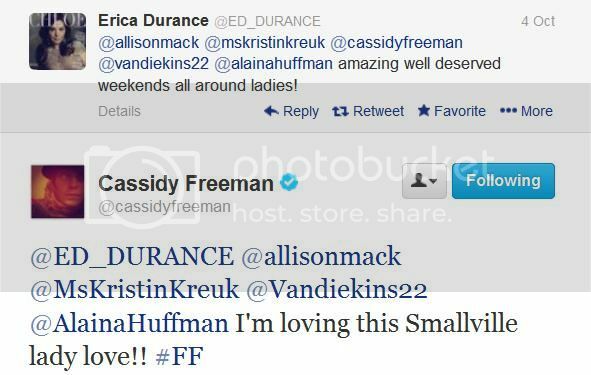 Yeah, the SV cast always seemed like a convivial, non-diva bunch! Justin's response did make me laugh - he seems quite amusing. He's rebounded onto the drama "Revenge" and has been busy making out with a hot guy.